Hog futures were under pressure from the morning open on Monday but managed to close higher. April hogs briefly fell under $58 and then rallied more than $1 in the last half of the day, mark modest gains. Summer futures marked the best gains for the day with June up to $1.275, and July rose $1.45. The lean hog index started the week down $.36 at $56.53 and the weekend slaughter data indicates another $.39 lower for Tuesday. 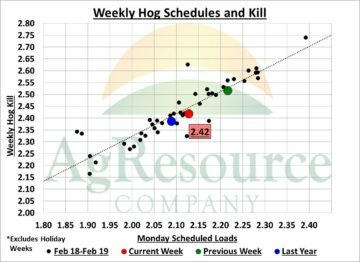 After falling sharply since the start of the year, hog futures are back at value. April closed Monday at less than $3 over the lean hog index, and June was near $20. Initial technical targets for June are just above $78 where an open chart gap and the 200-day moving come together.